Endorsed by current England captain Joe Root and established international cricketers such as Steven Smith, Gary Balance and Liam Plunkett, the 2018 New Balance bag range has been revamped for this year to offer an exciting, practical range for 2018. 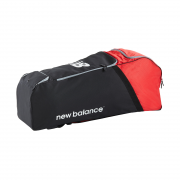 Available in two exciting, vibrant colour ways, New Balance have launched an exciting range of durable, practical and spacious cricket bags enabling cricketers to organise their cricket kit efficiently. 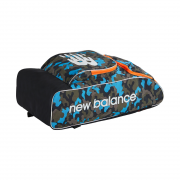 Whether you prefer the conventional cricket wheelie bag or a modern duffle bag, New Balance have a range of innovative cricket bag designs to suit your needs. As mentioned there are two colour ways available: The TC Range and The DC Range. Available in a variety of different sizes and storage capacities, cricketers have numerous options to choose from such as the portable and spacious TC 1260 and the DC 1080 Duffle Bag or the new DC 1080 and TC 1260 Stand Up Cricket Bags containing an innovative design aimed to provide extra space in the dressing room without compromising on storage capacity. Whether you are a junior cricketer making your way into the game, or you're an established professional, New Balance have a cricket bag to suit your needs. In the range is the New Balance TC 560 Cricket Bag which is a very good option for club players as it included a Fantastic Integrated Wheel Set, 4 Compartments with a Seperate Bat Compartment as well as a BIG back to fit all of your equipment in. Keep an eye on this bag as expect it to sell VERY quickly as move into 2017. BRAND NEW to All Rounder for 2017 is the New Balance Duffle 1080 Cricket Bag which we expect to offer players something different with their luggage equipment needs. This would be a great option for those wanting to carry enough for Training and Net Sessions with 4 Compartments allowing plenty of space throughout.